In C language, the If statement is used when we want to test a condition, which is evaluated for a boolean value - true or false. 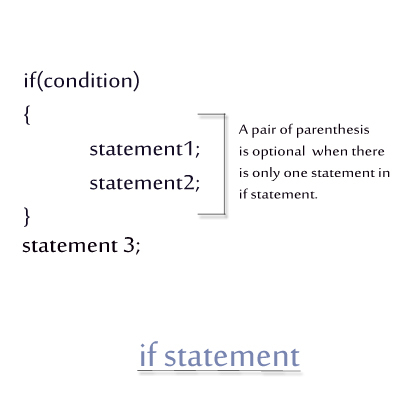 If this condition is true then the statement or a block of statements connected to the If statement is executed. If this continue is false then the statement or a block of statements connected to the If statement is not executed. The first if statement condition - 100>5, is true, hence its printf() statement prints its message. The second if statement condition - 50>100 is true, hence its associated printf() statement is executed. The last if statement condition - 2>4 is false, hence its printf() statement is not executed. Finally, the printf() statement outside the if block is executed without an issue.